In April/May 2018 I visited Morocco as part of a longer Mediterranean visit. The Morocco tour was organized by Best Travel Morocco. Everything worked out very well, I can recommend this travel company. After arrival from my flight from Germany to Casablanca I was picked up at the airport and transferred to a hotel in Casablanca for a night. The next day we did a city tour of Casablanca with a visit to the Hassan II Mosque. Later that morning we continued to Rabat for tour of the city and the medina of Rabat. We then continued north through the Rif Mountains to Chefchaouen, where I stayed for two nights. We did a walking tour through Chefchaouen on my full day there. It is a very picturesque town. From Chefchaouen we continued back to the south to the Roman city of Volubilis, then through Meknes to Fez, where I stayed for two nights. A walking tour through the medina of Fez was a great experience. 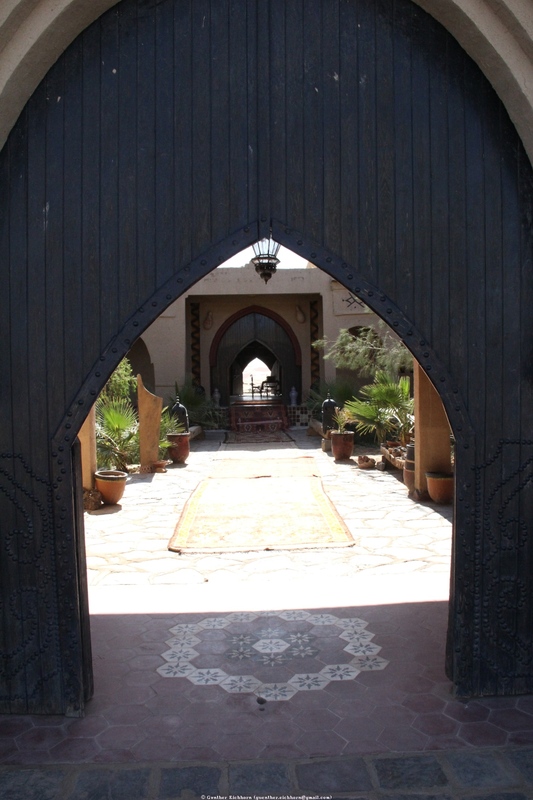 From Fez we continued south to Merzouga on the fringes of the Sahara Desert, where I stayed one night in a hotel. The drive through the Middle Atlas and the High Atlas was very scenic. In Merzouga we walked through the oasis to see what the local farming looks like. In the afternoon I went on a camel ride into the Erg Chebbi for a one night stay in a desert camp. Erg Chebbi is one of Morocco's two Saharan ergs – large seas of dunes formed by wind-blown sand. From the Erg Chebbi we continued west to the Todgha River Gorge and then to the Dades Valley, where I stayed for one night. In the Dades Valley we did a very nice hike through the Valley of the Figs, a very narrow slot canyon. From the Dades Valley we continued west through the Roses Valley, Ouarzazate to Aït Ben Haddou, another UNESCO World Heritage Site. 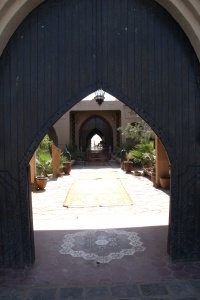 From there we crossed the High Atlas again and continued on to Marrakesh, where I stayed for two more nights. Marrakesh has another interesting medina, as well as interesting palaces and mosques. From Marrakesh we returned to Casablanca for another night before my flight back to Germany. 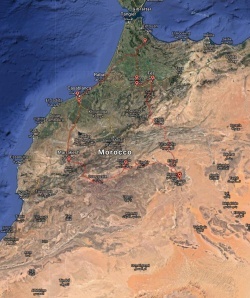 Morocco has a lot of interesting sites, many of them are UNESCO World Heritage sites. I especially like Chefchaouen and the medina of Fez. Driving around Morocco was no problem, the roads were all in good condition. There were a lot of police stops, but we didn't have any problems. Traffic was fairly disciplined most of the time, only in Marrakesh was it a bit wild. My guide/driver Rashid was knowledgeable. He was with me the whole trip through Morocco. I visited several medinas in Morocco, the medinas of Fez, Chefchaouen, Marrakesh, and Rabat. It is fascinating to walk around these medinas with their narrow, winding alleys. A medina quarter is a distinct city section found in a number of North African and Maltese cities. A medina is typically walled, with many narrow and maze-like streets. The word "medina" itself simply means "city" or "town" in modern-day Arabic although it was borrowed from an Aramaic-Hebrew word (also "medina") referring to a city or populated area. The food and beer in Casablanca in the hotel was mediocre and expensive. Beer was usually quite expensive when it was available, more often than not, it was not available at all. I ended up buying a few bottles of red wine in stores (it doesn't need refrigeration). Several of the hotels did not have alcohol, but they had no problem with me bringing my own wine for dinner. Morocco is well worth a visit. It has a lot of history and many interesting sites. My greatest interest is usually wildlife, there is not much of that in Morocco. But that is made up for by the interesting historical sites. It was an interesting visit.